This “Big M” Montclair started life in Los Angles California on January 23rd 1956. It was the 145th car off the assembly line that day. Apparently, the car spent most of its life in California, as research indicates it was titled there as late as 2002. While in California it came into the possession of William Maynes who subsequently moved to Glide Oregon. In 2013 Maynes sold what was essentially a restorable hulk in complete and original condition to Bob Kuehn of Stanton NE. Bob in turn passed ownership to Ken Nagel that same year. 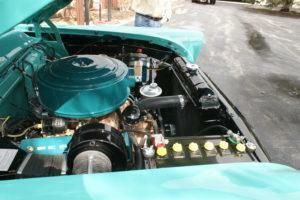 In the fall of 2013 Ken commissioned Bob to begin a full concours level restoration. 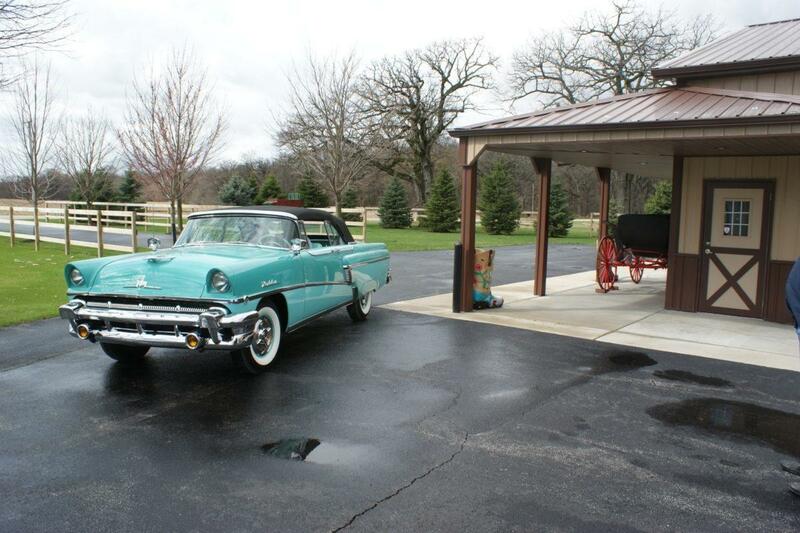 Recognized as one of the country’s foremost restoration experts specializing in 50’s era Mercury, Bob is known for his painstaking attention to detail and fastidious authenticity. 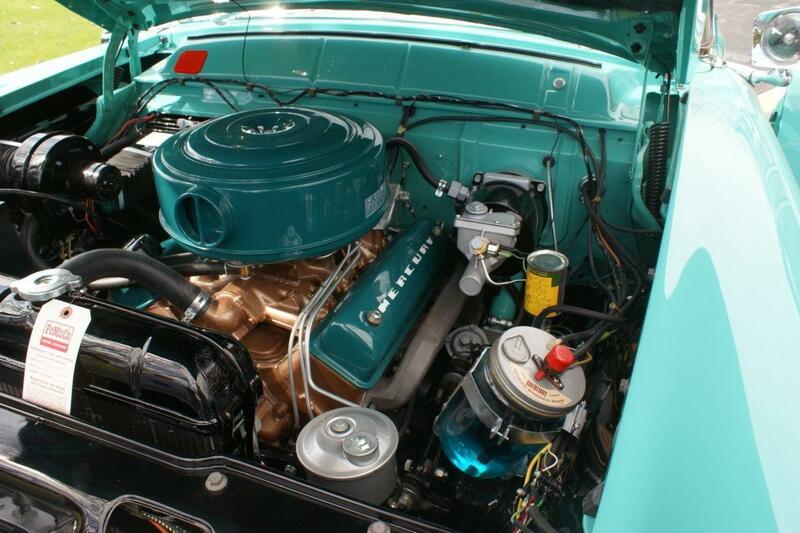 Incorporating both factory NOS and fully reconditioned parts to bring the car to “as new” condition, the artfully done frame-off, nut and bolt restoration took more than two years to complete. The time and attention Bob lavished on this car makes it one of the best if not THE BEST in the country, certain to satisfy even the most particular connoisseur of fine ’50 era collector cars. 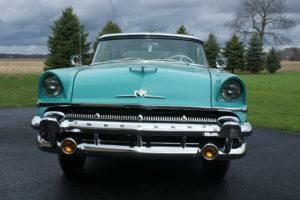 1956 marked the last year of conservative automobile design in the U.S. Designs became progressively more extravagant until the trend reversed sometime around 1963. 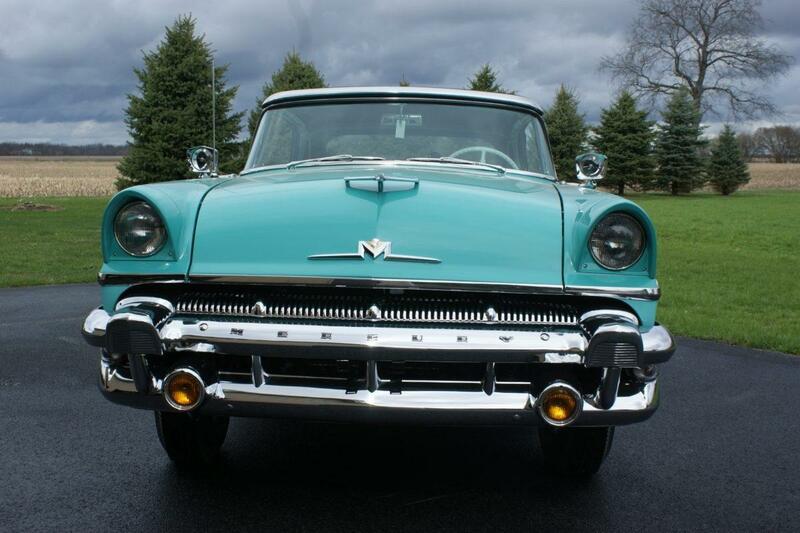 And so it was that the 1956 Mercury’s were the last evolution of the elegant and tastefully styled models that had their beginning in 1949 and are still regarded as the high water mark of Mercury style and technical achievement of the era. Their soft alluring curves stood in contrast to the sharp features and fins that were emerging in the market place. 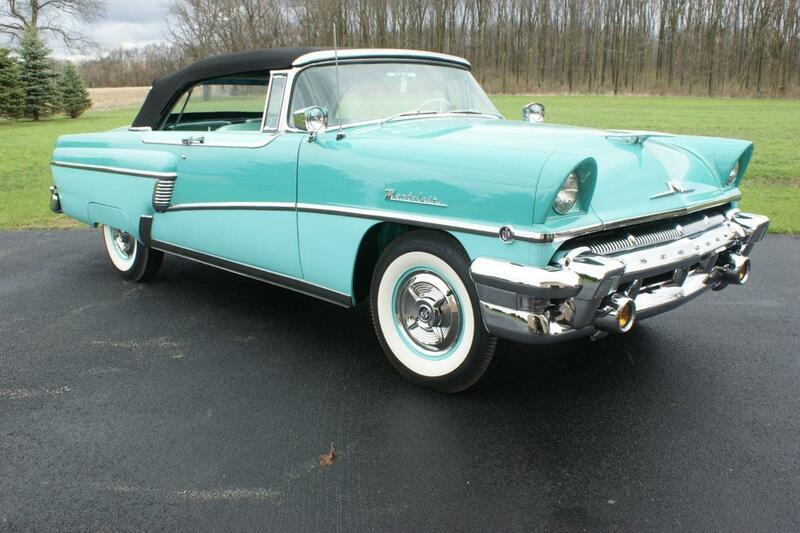 A beautiful array sporty tropical colors were Mercury’s only concession made to the future flamboyance of the ’50’s. Total Mercury production for 1956 stood at 327,943 vehicles, 91,434 were Montclair models of which only 7,762 were convertibles. Because the sleek, aerodynamic shapes were a favorite of hot rodders and customizers of the era it is exceedingly difficult to find one of these cars in restorable condition. 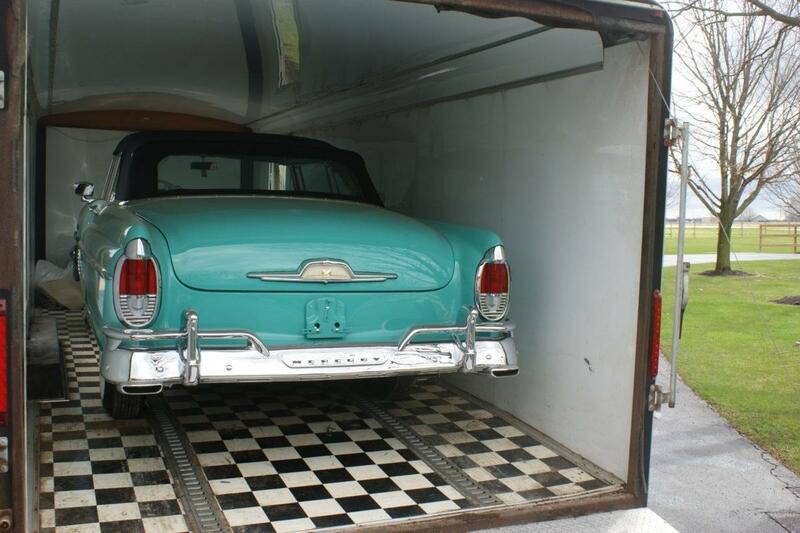 This is especially true of convertible examples that suffered low survivability rates because they were more vulnerable to the ravages of the elements, making them even more prized by collectors. 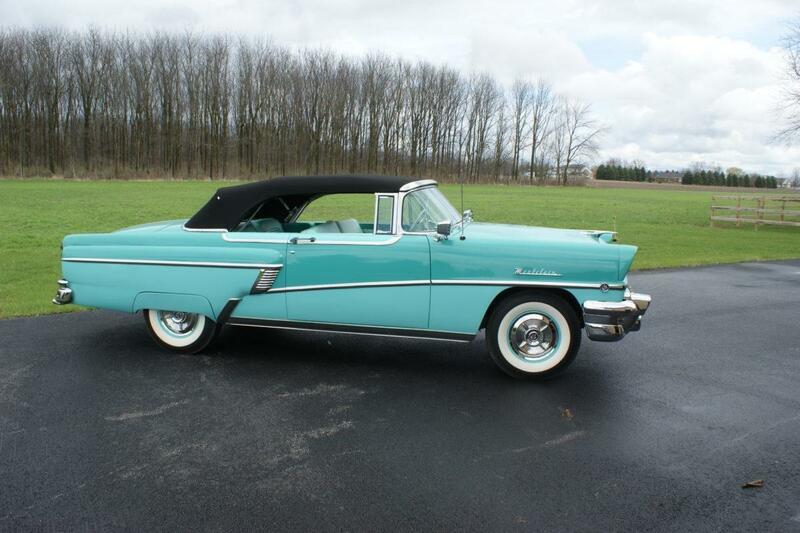 The ’56 Montclair convertible on display in the Ken Nagel collection is a beautifully done matching numbers example of these scarce and graceful cars. Tastefully finished in flawless and rarely seen two tone Verona Green over Heath Green color combination, it is the pinnacle of perfection. Featuring impressive matching interior upholstery accented with a black convertible top, Ken’s car is both colorfully sporty and elegant. 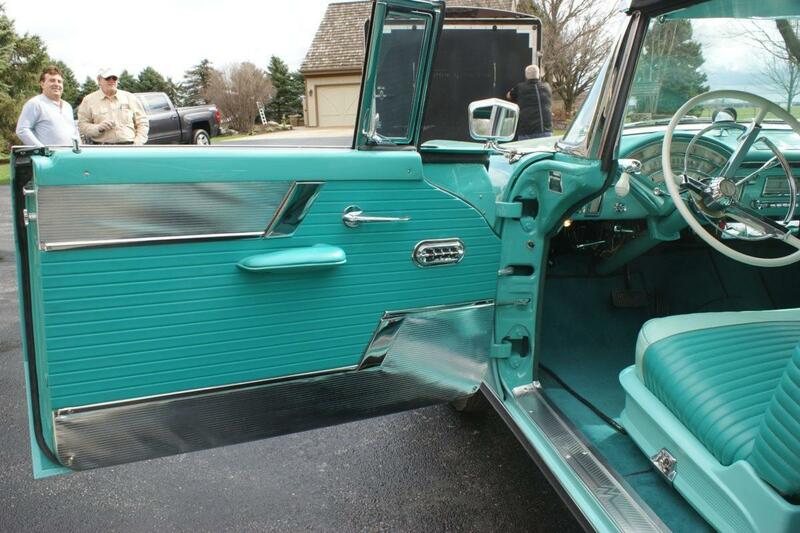 The contrasting color panel design feature that runs beneath the side windows on the upper door sills was exclusive to the Montclair and showcased some of Mercury’s best features including the Flow Tone paint combination and the additional chrome trim. Top down motoring on enchanted summer evenings just didn’t get any better than this. Mercury offered no less than 32 exterior Flow Tone paint combinations and matching interiors for the Montclair. The extensive yet subtle “tropically” pastel pallet complimented the Mercury marque and enhanced its style. With exotic names like Persimmon, Heath Green, Niagara Blue and Verona Green among the selections available Mercury met the growing demand for more vibrant color choices that evoked top down balmy summer nights without being audacious. 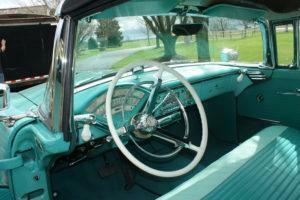 The Montclair model was the top of the top of the line Merc in the mid-Fifties. No one seems to know the origin of the “Montclair” name. The consensus is that it’s taken from the upper-class community of Montclair, New Jersey. 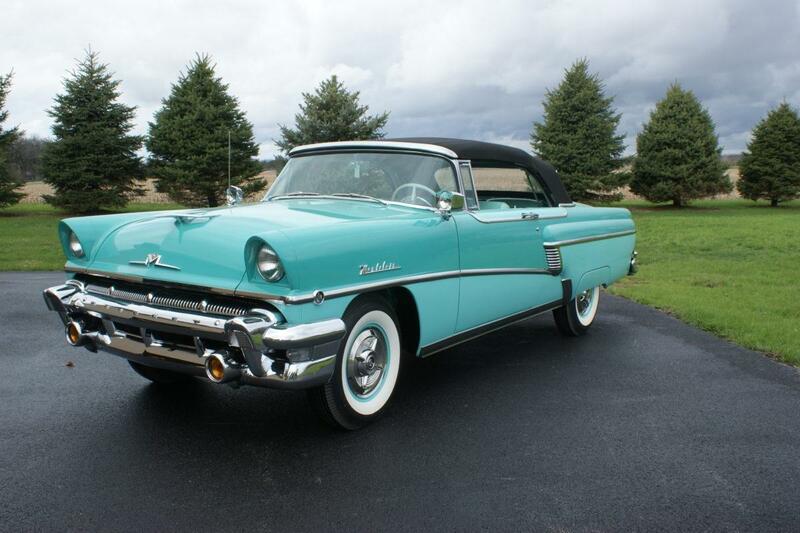 Montclair presented bright new styling, higher grade trim and more standard equipment in 1956. 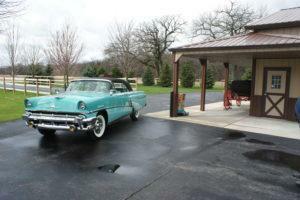 The 1956 Mercury Montclair convertible displayed in Ken’s collection is among the finest examples in the country and illustrates those features. There were relatively few options offered to the buyer since many popular items were included as standard on the Montclair. 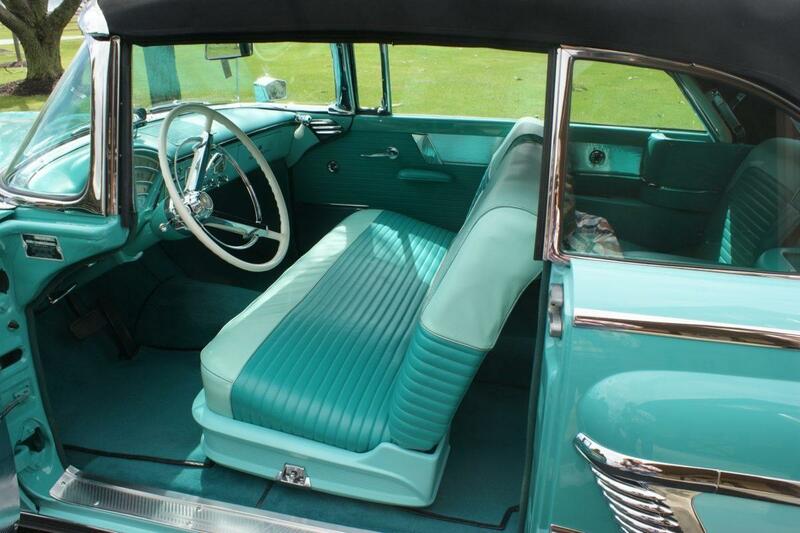 1956 was the year that Ford introduced its Lifeguard safety program, and the Mercury Montclair came standard with a deep-dish steering wheel, safety door locks, a breakaway rear view mirror, optional seat belts and padded door panels & dashboard covering a redesigned three-tier instrument panel. 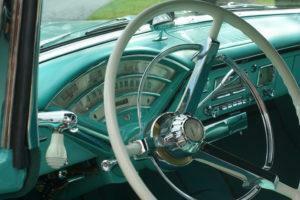 A Town & Country radio, tissue dispenser and clock finish off the look of the dash. Even though the options list was relatively short because many popular items came standard, Ken’s luxurious example boasts some of the rarest and most stylish available. 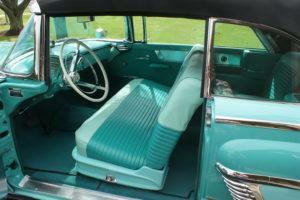 Expensively appealing appointments include the very rare power seats, windows, top, and fender skirts. Adding some chrome glitz are the dual side mounted spotlights with integrated rearview mirrors. While the ’56 “Big M” certainly is sleek and smart with distinctive lines making for visually stunning appeal, the beauty goes well beyond skin deep and is matched, if not exceeded, by the extraordinary engineering that lies beneath the smooth sheet metal and gleaming two tone finish. Leading the extensive list of technical advances incorporated in Ken’s car is the innovative ball joint suspension and the “Multi-Luber” power lubrication system. An automotive first, exclusive with Mercury, the system automatically lubricates all front suspension and steering points. Promoted as “Dashboard Lubrication”, the car’s owner simply pushed a button once a day or every 50 miles of highway driving to lubricate every joint, except the universals. The new chassis was skillfully engineered to provide better handling and road stability. The extra strength frame, long leaf rear springs that adjusted automatically to load tension and double acting shock absorbers all contributed to a solid comfortably luxurious ride. A high ratio rear axle increased fuel economy. 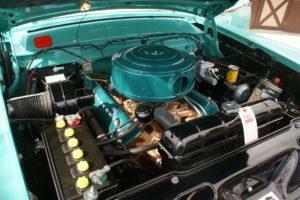 Power is supplied by the reliable Y block V8 engine. 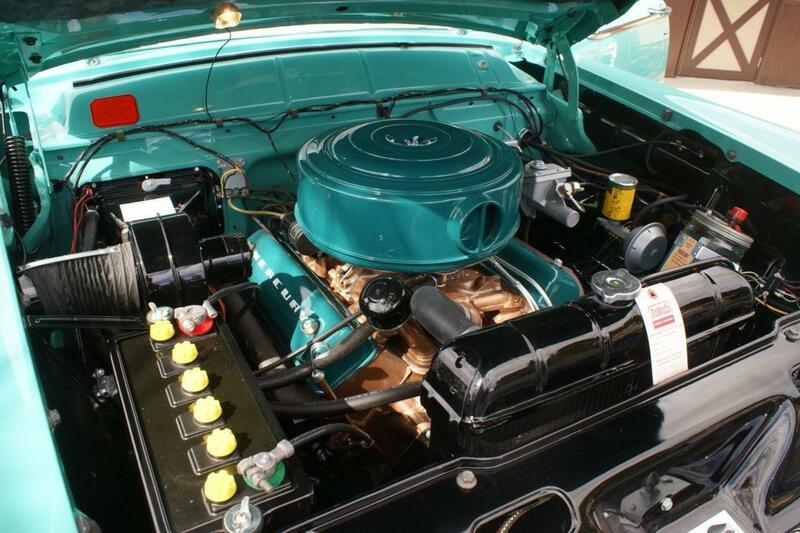 The blue valve covers and air cleaner immediately identify it as the 312 Cu In version with 8.4:1 compression and a 4 barrel carburetor producing 225 HP when bolted to the optional Merc-O-Matic transmission. Stir all these features together and you have a car with extraordinary beauty, exceptional ride, responsive handling and spirited performance. For those old enough to remember those bygone days of dazzling automobile colors, shapes and performance and lament the passing of that era, perhaps never to be seen again, and for those seeing these cars for the first time dressed in all their former glory, be assured that there are those who resolve to value and preserve these survivors of a time when unrestricted imagination in design and engineering lifted the automobile to an art form appreciated by the owners they were meant to dazzle. Mercury was an automobile marque of the Ford Motor Company launched in 1938 by Edsel Ford, son of Henry Ford to market entry-level luxury cars in between Ford and Lincoln-branded luxury vehicles. A casualty of the economic downturn at the beginning of the 21st century, production of Mercury vehicles ceased in the fourth quarter of 2010 with final Mercury rolling off the assembly line on January 4, 2011.